The best time to catch sales is between seasons, as stores are trying to clear the shelves to make room for the next batch of stuff. I went to Target and Ulta a couple weeks ago and decided to try some products I haven’t tried before, and went back to Ulta last weekend, so now I have two trips worth of products to show you! I don’t usually like to shop at Ulta for drugstore products (it’s often more expensive, and I’m not in love with their coupon and rewards systems), but it’s worth it when there are any deals or sales going on. Anyway, I just thought I’d let you know my first impressions of these products as I’ve been starting to use them. I love my NYX pencil in Milk, so I was really excited to try another color! I tried this one on, and I have to say, it performs as well as a cream eyeshadow. The color is beautiful as well and could work great as a one-shadow eye look. I’ve been searching for this for ages, and it’s been sold out everywhere! I finally found it at Target and snagged it right up. I’ve been using this in my waterline every day to brighten up my eyes a bit, and it’s perfect. I can’t resist a bulk purchase. I didn’t have this Lip Butter shade yet, so I figured I may as well try it. It’s shimmery, which I usually don’t love, but since it’s thinner than a lipstick and a great shade, I have been liking it. It also seems to last a really long time for a lip butter. I’ve been curious about this mascara, so once I saw that I could get two for the price of one, I went for it. It doesn’t do anything amazing to my lashes, but for day-to-day I really like it! 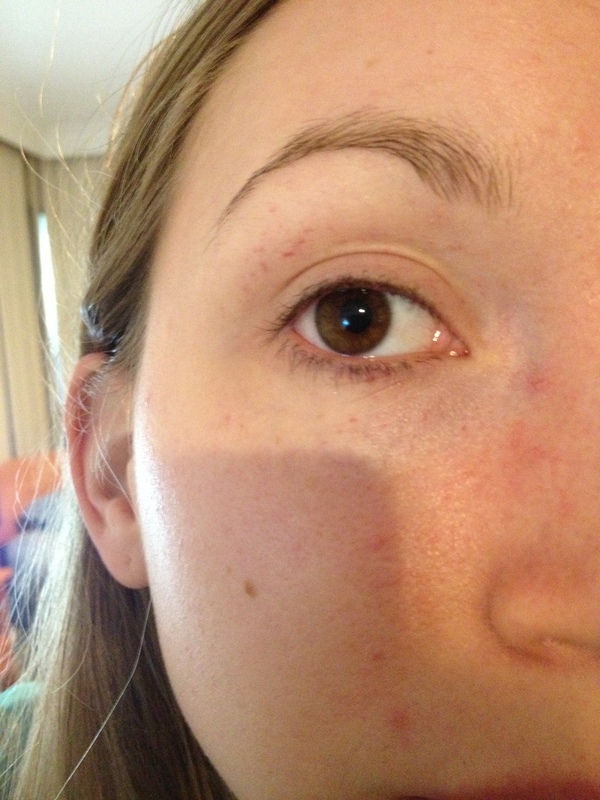 It really doesn’t clump at all, so it’s good for layering with other mascaras too. Target was clearing out their summer colors, so I took advantage. I love the formula for the Insta-Dri polishes, and the regular line shades are really pigmented as well. I haven’t used all of them quite yet, but I’m looking forward to it. 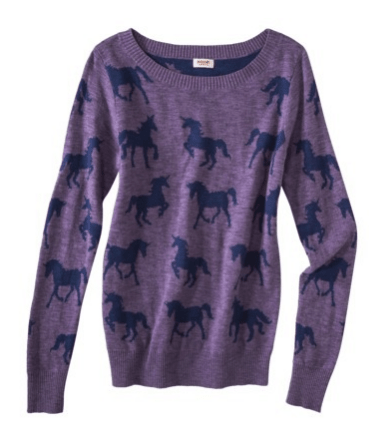 How could I say no to a unicorn sweater? It was the only one left, so I had to have it. I also got these grey/taupe booties, which were $10 off. They’re really comfortable and cute with shorts as well as jeans, but it started raining a couple days after I got them, so I haven’t been able to wear them much yet! I blame Pittsburgh! I’ve been wanting this foundation for a really long time, so I thought I’d go ahead and get it while I had a 20% off coupon. I’ve only worn it a couple times, but I’m happy with the fuller coverage it gives, since I didn’t own a full coverage foundation before. It does give me dry patches, though, which is strange considering I have oily/combination skin and that’s the formula of the foundation that I got. I’m also not sure how long it lasts on my skin. I’ll know as I continue to use it. I wrote a review of this brush recently, but to recap, I wanted this brush for a while and I’m very happy I got it! Nooo! Sadly, it had to be returned. Ulta was really great about it; I didn’t have the receipt with me but they were able to look it up since I used my rewards card when I bought it. But I’m still bummed! I decided to make the most of my trip to return the eye cream, and I took advantage of some really good deals, which I showed you guys on Instagram: BOGO 1/2 off most drugstore items and a free gift with purchase for Ulta brand products. Combined with $8 off in points I had on my rewards account, I ended up with $49 worth of products for about $18. I’ve heard great things about this concealer, and I like the coverage on the foundation, so it seemed logical to try this too. It’s a little bit darker than I normally would buy just because I have a bunch of concealers sitting around that are too light for me, so I bought this planning on mixing it with my other concealers. However, it ended up being a really close match by itself, so I can mix it with a lighter shade to change the tone or texture or I can wear it alone. I guess the lesson here is that I’m really bad at picking out concealer shades. Anyway, I love that this concealer is thick but still goes on as a liquid. It isn’t cakey and it almost covers my dark circles. Win! I had one of these palettes as a preteen and remembered really liking it, so I thought I’d try it again ten years later and see if I still feel the same way. I also like the idea of having a set of cream shadows for traveling, versus having to bring multiple pots of cream shadow. I chose this palette basically for pink shade with gold shimmer, and I liked that it includes one matte shade. I’ve only used them a couple times, but I quickly relearned that they’re so creamy that putting on too much at once will make it crease. I still think the colors are beautiful, though, so I’ll keep playing around with it to see how I can make the most out of it. I decided to spend all of the $12 needed for the free gift on just these shadows because I fell in love with the colors. They are very pigmented and seem to last a long time. They are very creamy and so I definitely use less of these than I’d use of a firmer cream eyeshadow, but these take a little longer to set because of it. I was most excited to use Shimmering Topaz (bottom right), but it seemed to add more shimmer than color to my lid. Again, I’ll need keep trying these out and get back to you. I chose this liner as my free gift because they didn’t have black, so why not go for a color I haven’t tried before? I love this green with my brown eyes, and I think it’s a good fall color that’s bright enough for spring and summer as well. It goes on really smoothly and doesn’t smudge once it’s set, so I’m really in love with this liner so far. Whew, that was longer than I thought it would be! What deals have you taken advantage of lately? The lip butters are definitely worth a try. I love pink truffle for a nice basic but candy apple or red velvet for some color! I hope you find similar deals at your Target. And thanks for your sympathies about my eye…it wasn’t painful, just a bit confusing! It went away after a few days with a different eye cream. I love seeing those Target clearance stickers – especially on nail polish. You could keep it closed until next summer and, it would work just fine in 2014! That’s the plan! I was so excited to see so many nail polishes on clearance.